Belgian chocolate is on the move. Where most Belgian chocolate used to be made by two big industrial manufacturers, we see a steady stream of new chocolate makers rising who decide to take matters in their own hands. People who know there is more to cocoa than the generic flavor we get in every mass made bar or product. Jean-Philippe Darcis, bases in Verviers Belgium is an awarded chocolatier who recently decided to launch his own bean to bar line of chocolate bars. Jean-Philippe has made his name in the chocolate world by creating stunning filled chocolates – several of them were awarded gold, silver and bronze during the International chocolate Awards 2015 and 2016. When such a chef decides to go bean to bar, the expectations are high. It takes a lot of effort to create chocolate starting from the unroasted bean. It is a process that requires a lot of research and experimenting before you get the result you are aiming for. 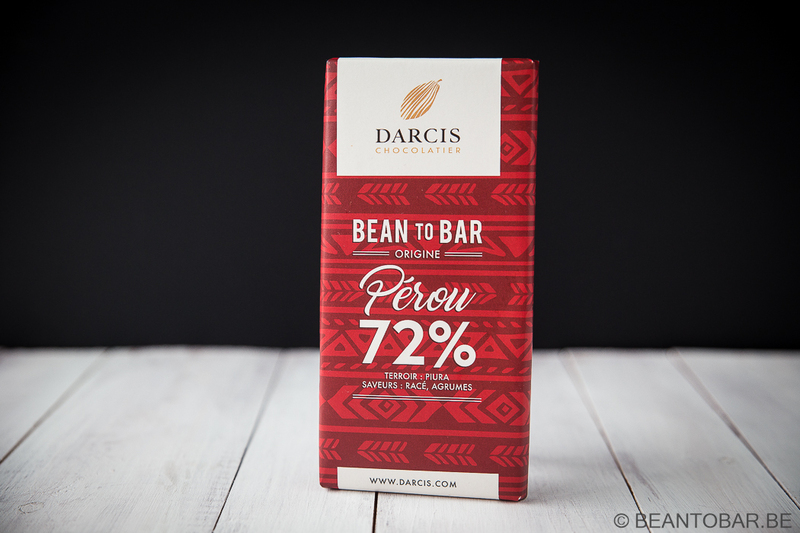 I found a 72% Peru bar made with Piura grown cocoa. 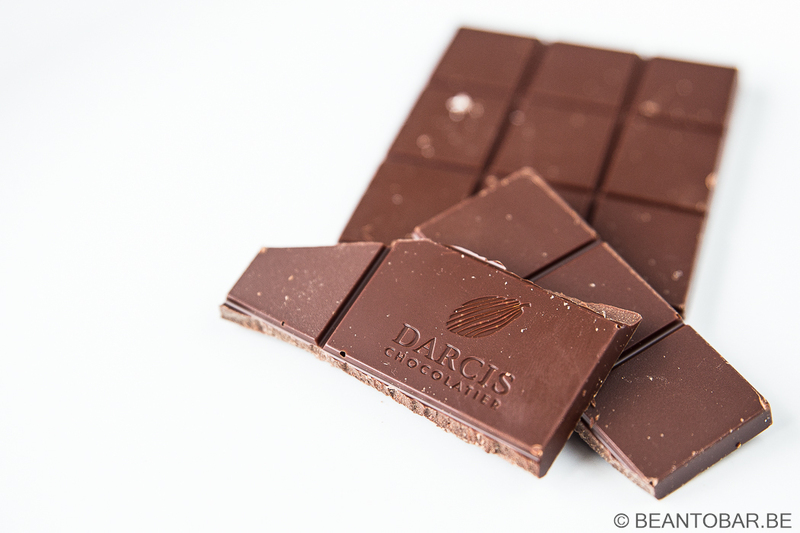 This origin is especially popular with chocolate makers so it is a great starting point to discover the work of Darcis. The chocolate bar is protected by a brigh red paper wrapper. An South-American Indian design is printed all over. The Darcis logo shows on top and in the middle you find the origin, percentage, terroir and tasting notes. It claims to be refined and promises citrus fruit flavors. On the back there is a triple language explanation (French, Dutch, English) about the origin and the required ingredients list. Inside the paper wrapper, a gold foil is found. The gold goes nicely with the red of the outer wrapper. The bar has a simple yet clean looking style. Large rectangular pieces all over, except for one bigger piece decorated with the Darcis logo. Classy looking. At 75 g, the bar is generous. It has a nice thickness and looks inviting. Taste: Nice snap. Starts of with roasted hazelnuts. Slowly flowing to chocolaty tones with a remaining nutty background. Every now and then you notice a little lemon touch, yet you really have to search for it. There is a touch of honey in the back. Roasted breadcrumbs trickle in. Near the end of the melt, there is a lactic feel, making the experience very close to a dark milk chocolate. 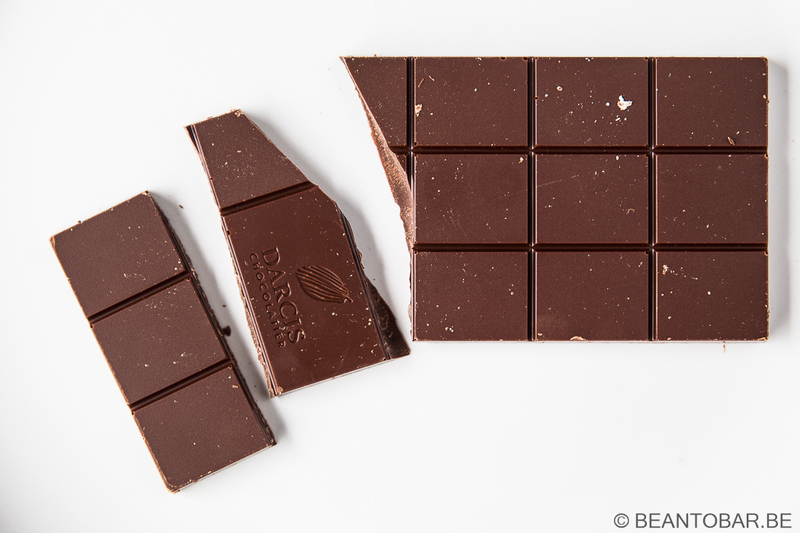 The chocolate is not quiet as complex as some of the other Piura bars I tasted in the past. Unfortunately the flavors seem all subdued and remain a bit too neutral for my liking. There are some extra flavor notes, but they remain subtle and don’t stand out in a bold way. The texture is slightly coarse, but the melt is nice and the chocolate isn’t filming in the mouth at all. I did detect a slight paper flavor in my bar. This is unfortunate for such a piece of chocolate, where everything should be about the glorious aroma’s of the cocoa. I can’t state the cause of this problem as I received it from a friend and don’t know how it was kept. We also had high temperatures in Belgium lately, but bars I bought longer ago don’t seem to have this problem. Perhaps the foils or paper wrapper have an influence? This bar is difficult to place. I can’t say that this is a bad piece of chocolate. It clearly stand out above average chocolate bars, yet I do feel that the flavor profile is a bit to well-behaved. It stays too close to the flavor of classic chocolate bars. It follows almost exactly the flavor profile of other Piura bars I tried in the past, but those were far bolder and more expressive. The off flavor of paper is throwing in a bit of weight as well in my final appreciation. Somehow I feel that this bar has more potential. I’m curious how the profile of this bar will evolve over time, when I buy new versions. I just hope Darcis can make it sing a little louder and clearer.